Geoffrey Clarke was the youngest of the so-called ‘geometry of fear’ sculptors who came to prominence at the 1952 Venice Biennale. He was an innovator who experimented with new materials and techniques to create works that are landmarks of that exciting era in British Sculpture. Clarke’s work first stood out whilst a student of stained glass at the Royal College of Art and was instrumental in his selection for one of the UK’s most important public commissions of the time, the windows of Coventry Cathedral. Experimenting with sculptures in polystyrene, a relatively new material in the 50s, Clarke discovered that he could use his originals for direct casting in aluminium which made each piece unique. The relative affordability of aluminium, its lightness and Clarke’s ability to cast it himself, put him at an advantage in winning a great number of public commissions during the post-war rebuilding initiative. 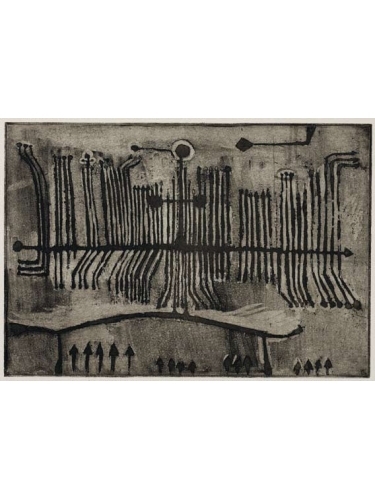 Clarke is also widely known as a printmaker, who produced over a hundred etchings, mostly between 1950 and 60. Allegorical in nature and taking Mankind as their subject, many were also designs for iron sculptures. He was born in Derbyshire and studied at Preston and Manchester Schools of Art. After serving in the War with the RAF he returned to his studies at Lancaster and Morecambe School of Arts and Crafts before moving to the Royal College of Art. His work is held in all major public and private collections around the world.